Marchettino - The ONLY official website: Lamborghini Egoista Sound! 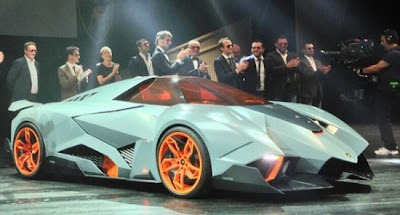 In utter surprise, yesterday night Lamborghini has shown to the media and the participants of the 50th Anniversary Grande Giro a new concept called Egoista to celebrate half century of the brand. The name fits perfectly because it means " selfish " and just like Ferruccio Lamborghini once said " I'm going to put the engine in the back, I don't want a passenger ", the Egoista is a single seater concept with a 5.2L V10 600hp engine located in the back. The car is designed from VolksWagen Group and obviously is heavily inspired from a jet fighter and looks to be the most extreme Lamborghini ever made.